When you want your PowerPoint presentation to contain carefully arranged elements without having to do excessive manual work, apply a template (.potx file). This gives you a jump-start on a new, blank presentation. In PowerPoint, click File, and then click New. Type a key word or phrase into the Search for online templates and themes field, and press Enter. 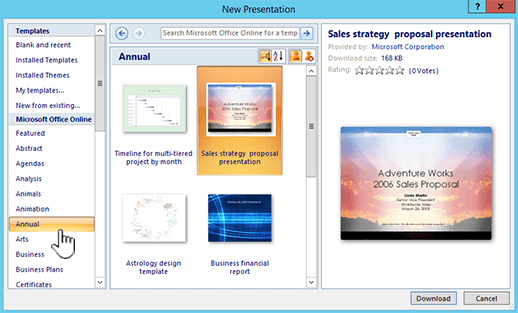 Tip: The template is downloaded to PowerPoint and you are ready to begin your presentation. Click Featured, and choose a template to use. Click Personal and pick a template that you've created. When you find the template that you want, click it to see the details, and then click Create. To reuse a template that you've recently used, click Recent Templates. To use a template that you installed to your local drive previously, click My Templates, click the template that you want, and then click OK. 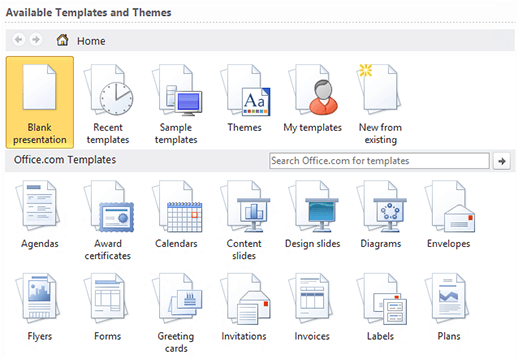 Under Office.com Templates, click a template category, select a template, and then click Download to download the template to your local drive. Under Templates, click Blank and recent, Installed Templates, or Installed Themes, click the built-in template that you want, and then click Create. Under Templates, click New from existing, locate and then click the other presentation file that contains the template, and then click Create New. Under Templates, click My templates, select a custom template that you created, and then click OK. Under Microsoft Office Online, click a template category, select a template, and then click Download to download the template from Microsoft Office Online. A PowerPoint template is a pattern or blueprint of a slide or group of slides that you save as a .potx file. Templates can contain layouts, colors, fonts, effects, background styles, and even content. You can create your own custom templates and store them, reuse them, and share them with others. 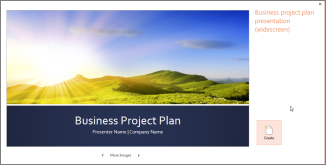 You can also find hundreds of different types of free templates on Office.com and on other partner websites that you can apply to your presentation.